Some of you will know that very soon after starting this blog I realised that shooting all my recipes on a smart phone, was very limiting and that I needed to quickly improve my photography. So when the Guild of Food Writers organised a food photography workshop I jumped at the chance. The Saturday before Easter I found myself, along with seven other members, in the Cook House at Borough Market, where the workshop was taking place, camera in hand eager to learn. I was not dissapointed. The workshop was presented by Cookery writer and Food stylist Geneivieve Taylor and food photographer Rob Wicks both of whom freely gave their time and expert knowledge and to whom I am extremely grateful. During the day Geneivieve knocked up a delicious lunch, and we got to shoot both the preparation and end result, with Rob giving us lots of advise and tips along the way. You can see for yourself how I got on on the day with the step pictures below and on my instagram page. Back at home and with some exchange of emails with Geneivieve I wrote up and tested the recipes that she cooked for lunch so that I can share them with you. The first dish was a roasted tomato salad which I shall be posting at a future date. 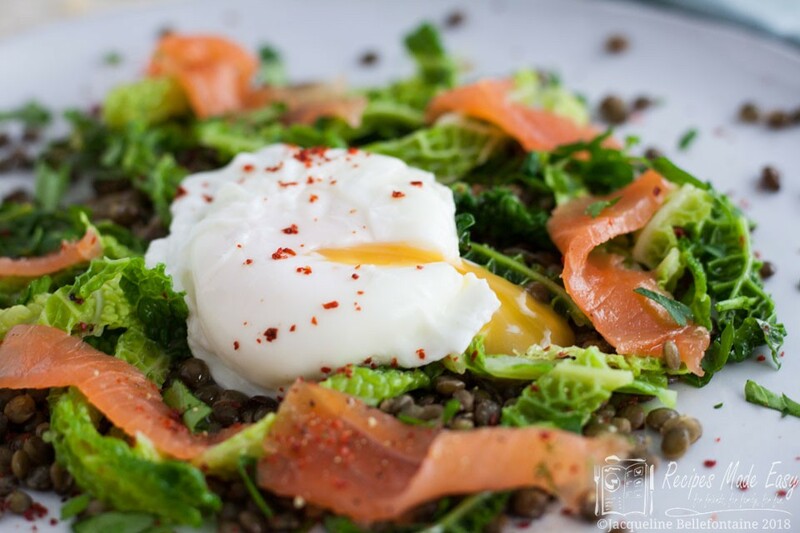 The second – a warm smoked salmon, lentil and poached egg salad, is ideal to make now. 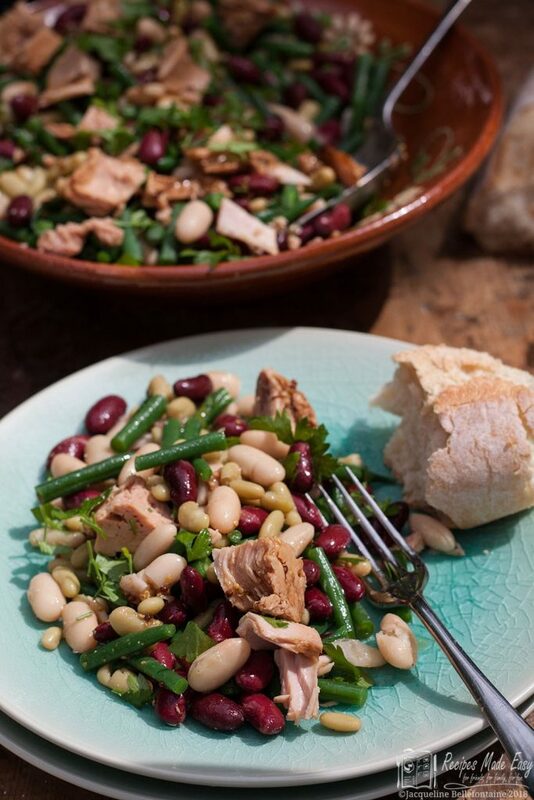 As the weather begins to brighten we start to think of lighter dishes and salads and this fits the bill perfectly. The lentils add substance to the salad and Savoy cabbages are really good right now. The smoked salmon and egg finish the dish perfectly. 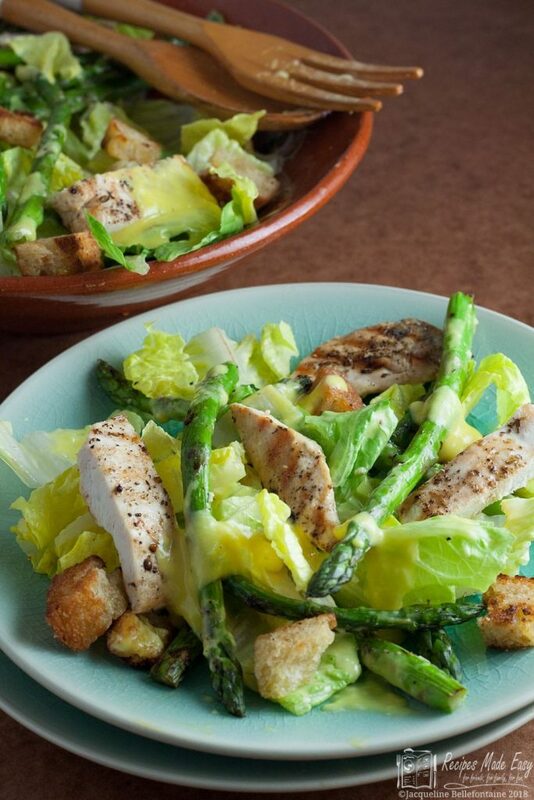 Not only does it make a great lunch dish, it would also make a really good starter. 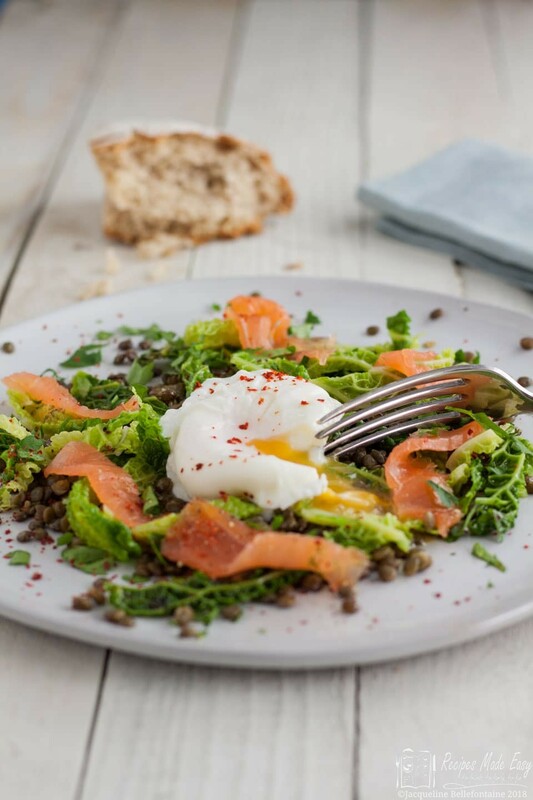 This dish of lentils cabbage, smoked salmon and eggs is a perfect winter or springtime salad. Serve as a light lunch or a simple starter. Rinse the puy lentils and place in a saucepan. Cover with about 2cm of water and bring to the boil. Lightly salt the water, reduce the heat and simmer for about 15 minutes until just tender. Remove the cabbage leaves from the cabbage, cut away and discard the tough centre stem. Shred the leaves and cook them in lightly salted boiling water for 4-5 minutes until just tender. Poach the eggs, bring a frying pan of water almost to the boil, then reduce the heat so that it is barely simmering. Crack the eggs into a small dish or cup then slip into the water. 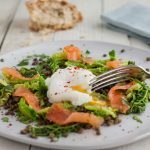 Poach for 3 minutes – Use a timer! While the eggs poach, drain the lentils and drizzle with about 1 tbsp of oil, no need to be exact. Toss to coat in the oil then scatter over the serving plates. Drain the cabbage, and return to the pan. Add the garlic and toss in another tablespoon or so of oil, then scatter over the lentils. Arrange some strips of smoked salmon on the plates and sprinkle with chopped parsley. Lift the eggs out of the water with a draining spoon and place in the centre of the salad. Drizzle with a little more oil, season with black paper and a sprinkling of Aleppo pepper. Seperate the cabbage leaves and cut away the tough centre core of each leaf. Shred the cabbage and wash well. Slice or chop the garlic. Slip the eggs into barely simmering water. Boil lentils until just tender. Drain, toss in a little oil and scatter on plates. 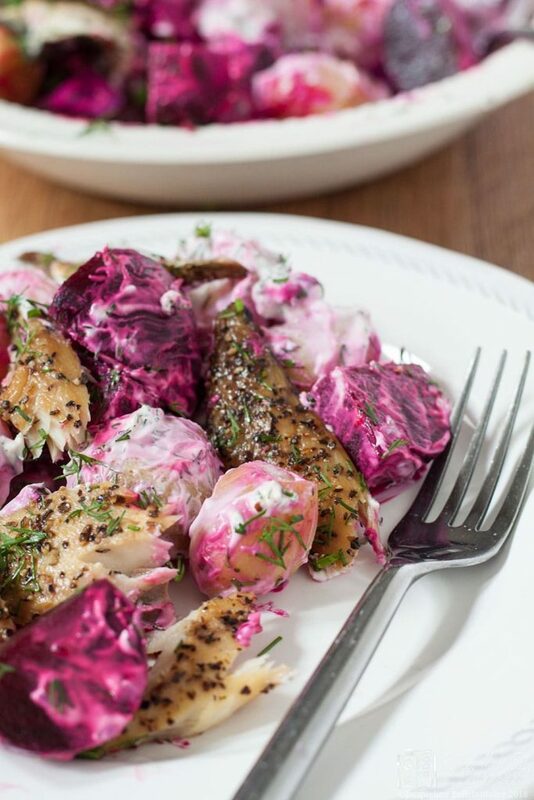 Arrange strips of smoked salmon on top of the cabbage. Remove poached eggs from the water. Arrange eggs on top of the salad. Drizzle with a little oil, garnish with pepper or parsley and serve immediately. There is nothing fancy about this dish. The key to success is to use really good quality ingredients, so use the freshest ingredients and the best oil you can . Once you have the lentils cooking, prepare all the other ingredients so that when it comes to serving you can quickly assemble the dish. Wet garlic was just coming into season (Wet garlic is the early new season garlic that has not been hung to dry. Most of the garlic we use everyday is dry garlic) and we used this for our lunch. Wet garlic has a creamy texture and although the flavour is quite strong it is not at all bitter and so you can use more. Use wet garlic if you can get it, but if you use regular dry garlic less is needed. The most important tip I can give for perfect poached eggs is use the freshest eggs you can, ideally no more than a few days old. I have to say mine were older than I would like, it can be hard getting really fresh eggs in London; the eggs I buy in Suffolk are always so much fresher. Crack the egg into a dish and then use the dish to slip the egg into the water. Make sure the water is barely simmering with just a few traces of bubbles rising to the top. I use a straight sided frying (sauté) pan filled with water about 2-3 cm deep to cook mine. At the workshop we also used Aleppo pepper, which is a mild chilli pepper from Syria with a beautiful bright orangey/red colour and a slight lemony heat but it’s not essential to the dish we just liked using it because it looks so pretty on the plate. You could use any mild dried chilli pepper, a pinch of sumac, a little paprika, fresh ground black pepper, or just chopped parsley to sprinkle on the dish to finish.